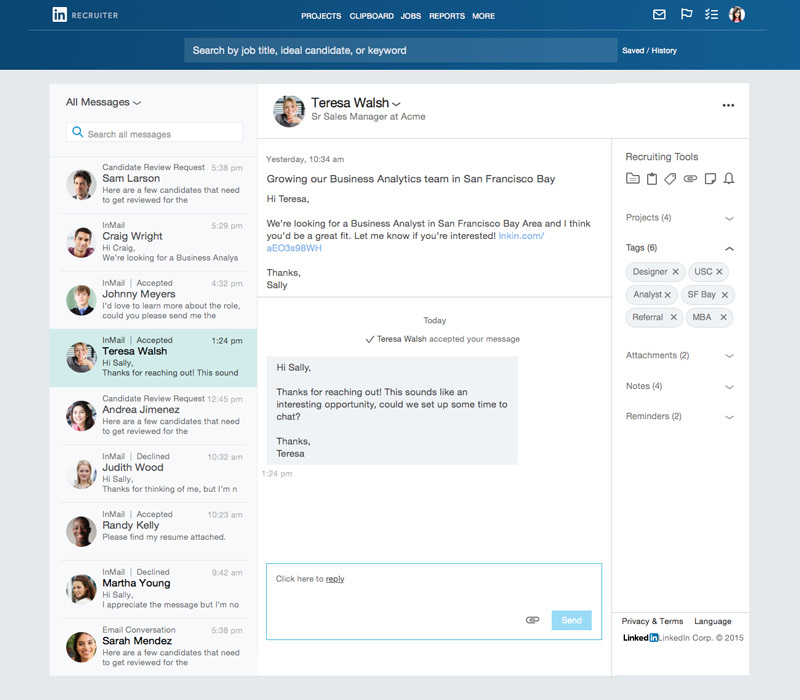 We’re excited to announce a redesigned LinkedIn Recruiter inbox experience that streamlines how you manage conversations and helps you build and maintain stronger relationships with your candidates. The new Recruiter inbox displays your complete conversation history with each candidate, and delivers important candidate details alongside the conversation. This intuitive and efficient messaging experience takes the work out of managing your inbox, so you can focus on building stronger relationships with your top candidates. 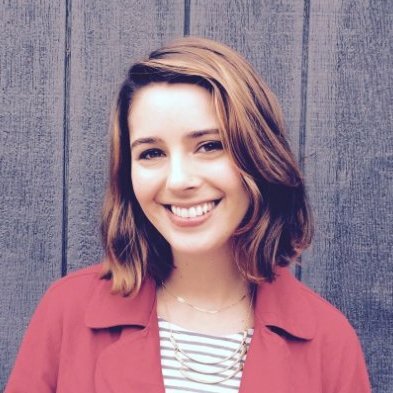 As a recruiter, you learn to juggle countless potential candidates at any given time. 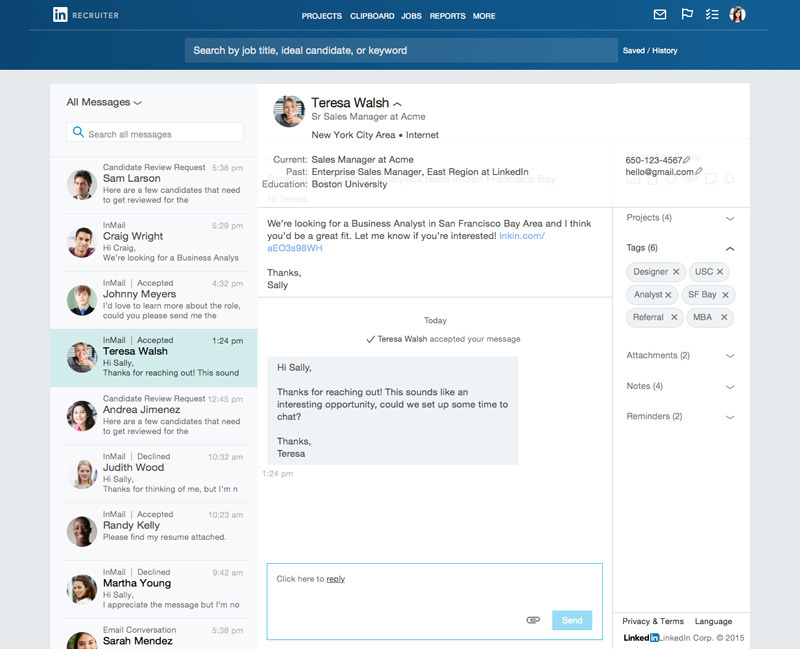 With Recruiter’s new threaded messaging experience, you can easily stay on top of each and every candidate conversation. Following up with candidates becomes much simpler, since you can now easily see where the conversation left off or quickly locate the email or phone number that was previously shared with you. With your entire conversation history in one place, you can quickly move past introductions and on to scheduling an interview. We’ve brought important candidate details into the inbox experience - which means no more jumping back and forth between their profile and the inbox. Quickly expand a candidate’s details to reveal relevant profile information, without ever leaving the conversation. Whether you want to quickly reference their professional experience, or simply need help remembering what that one special detail was about this candidate, now you’ll always have that information at hand. You can also use your familiar Recruiting Tools feature to reference and update a candidate’s notes, projects, or tags on the fly, and set reminders for yourself on a candidate’s status, keeping your team up to date at the same time. With so many messages coming and going, it can be tough to keep track of everything. New organizational capabilities have been added to help you find, filter, and follow up on important conversations. A dedicated inbox search bar allows you to quickly zero in on the conversation in mind, whether you search by candidate name or by keyword. And new conversation filters let you easily sort your conversation view by InMail status, replied status, or archive. Managing your inbox becomes a breeze, so you can focus more of your time on building your network of candidates. Check out the new inbox experience today, and let us know what you think!